While the winter weather hasn’t been very good for firing the groundhog kiln, I thought I’d add a brief post about the history of Edgefield pottery. I hope these weather systems with all of the rain and low pressure will let up soon! The drying racks are full of some nice pottery needing only fire to bring them to life. Keep your fingers crossed! As I’ve mentioned in previous posts, the pottery tradition that started here in the Old Edgefield District of South Carolina in the early 1800’s was possibly the most important in the United States to date. 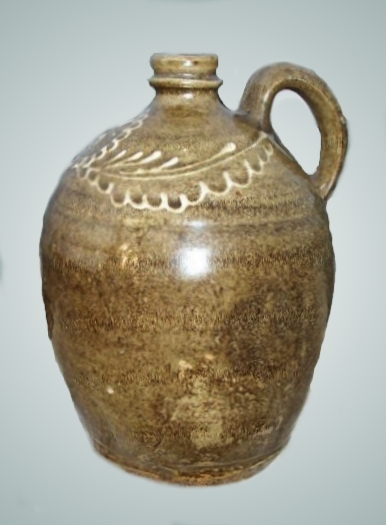 Although this method of pottery making was originally pioneered by the Chinese a couple of thousand years ago, it did not make much of an appearance in Europe or elsewhere until a local physician started experimenting with it in the early Nineteenth Century. 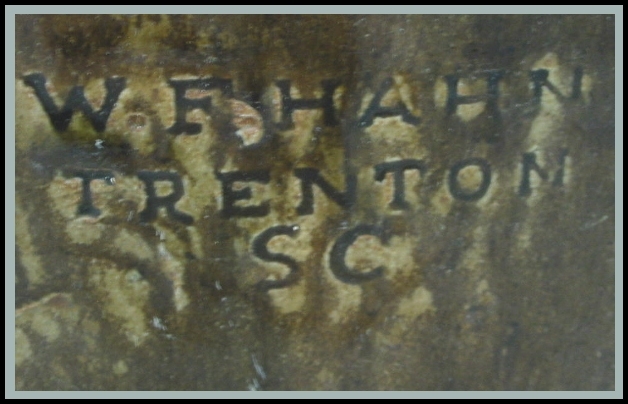 A maker’s mark from Hahn Pottery, approximately 1850. Most Edgefield ware was not marked or was marked by strange symbols such as dots, slashes or X’s. While early America slowly shifted away from the toxic lead-glazed earthenwares that were poisoning many there were few alternatives to replace it easily. The northern states had ample amounts of salt and good stoneware clays. 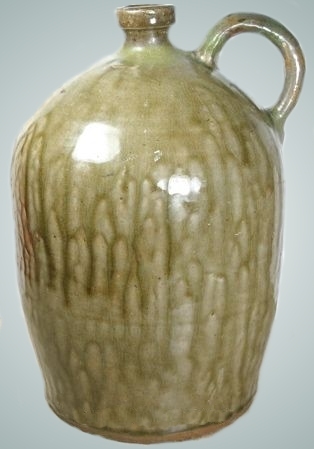 The immigrants to these states brought the salt-glazing technique with them from many parts of Europe and produced vast quantities of utilitarian pottery. The southern states lacked the access to salt. Salt was a valuable commodity in the south and was much needed for preserving meats and vegetables, especially for the large plantations and the many slaves that had to be fed. The local physician who ultimately founded this tradition was Abner Landrum. He was also a publisher of a small newspaper and a slave owner. He found that useable stoneware clays were found in this area around the fall line. He also discovered that the ash residue from the pottery kiln could be mixed with silica or sand and a bit of clay and water forming a slip to coat the raw pots with which would form a satisfactory glaze when fired to stoneware temeratures of around 2,300 degrees F. The aim was simply to form a sanitary surface on the pots which was easily cleaned. Aesthetics and glaze color was of no importance. Within a few years, others in the area emulated Landrum’s success and started potteries of their own, often as a supplement to farming. The rounded, ovoid or bulbous oriental forms were produced in vast quantities at the 20 or so potteries in this area and sent by wagon and later by rail throughout the south. This pottery-making tradition also spread throughout the southern tier of states and as far west as Texas. Since these potteries were dependant on slave labor, they tended to decline after the Civil War and with the advent of glass and metal storage containers. 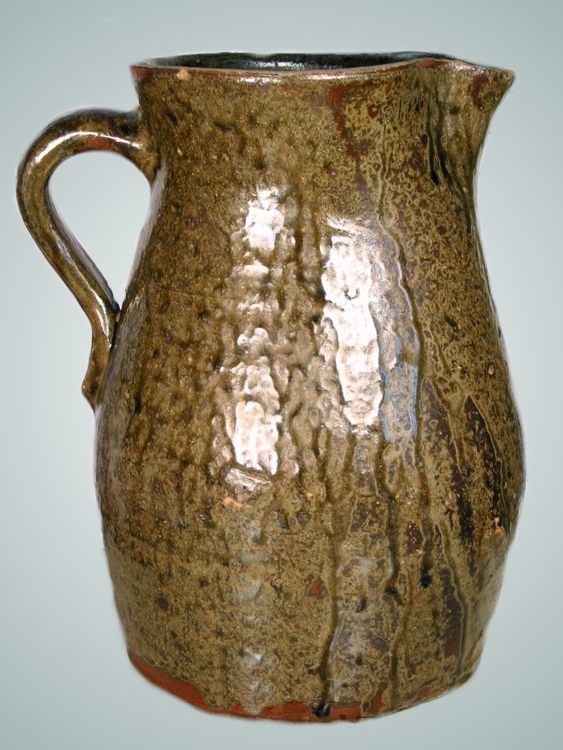 The last of the old traditional potteries died out in the early Twentieth Century. 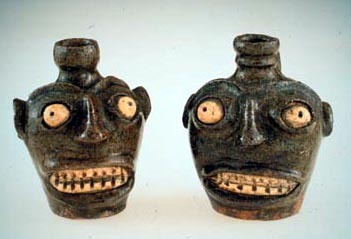 Without this unique pottery, the settlers of the south would have found it very difficult, if not impossible, to preserve and store foodstuffs. 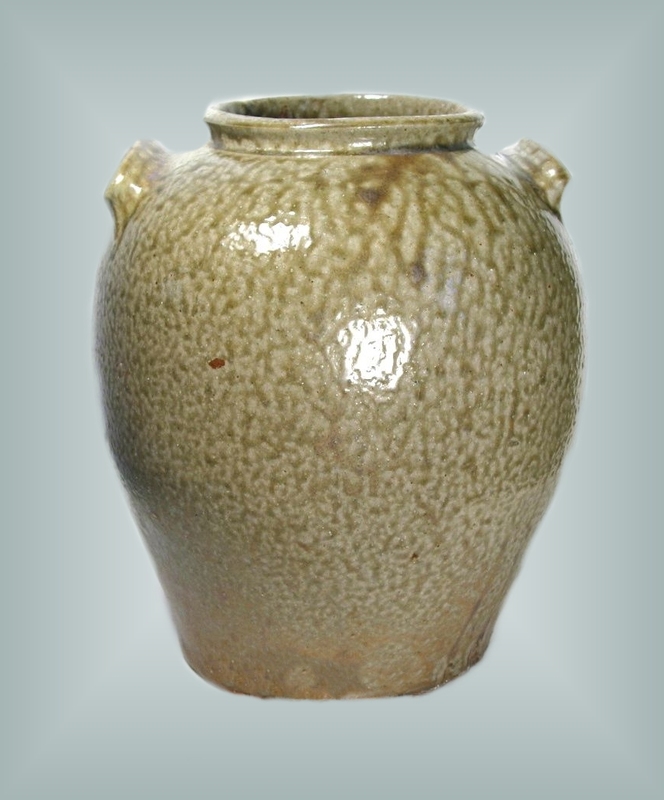 We now appreciate the runny, drippy beauty of these ash or alkaline-glazed pots! More and more collectors are bidding on fewer pots, driving prices on these old beauties through the roof! 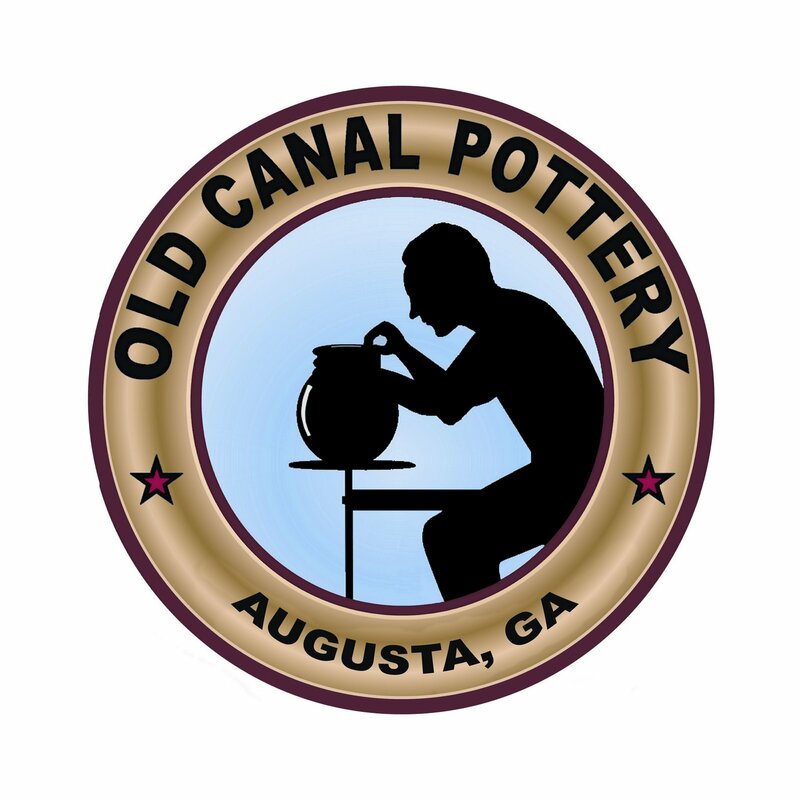 We at Old Canal Pottery are proud to revive this Southern tradition and artform using methods and materials that were used here almost 200 years ago. 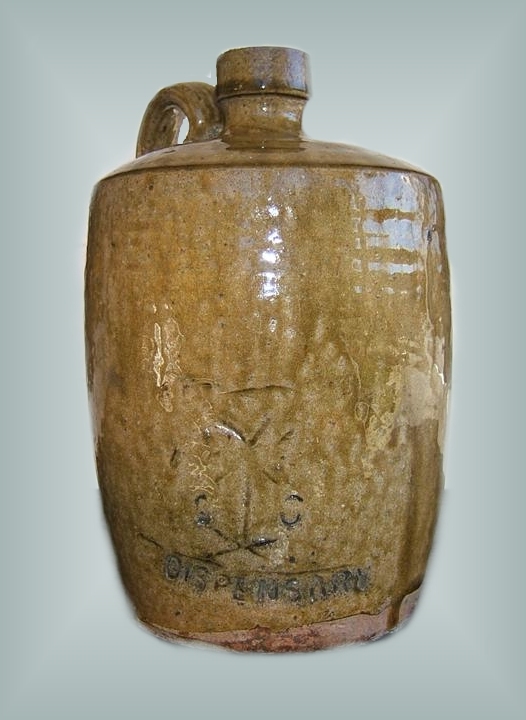 Our groundhog kiln produces the beautiful forms and glazes so sought after by collectors. We hope you will consider adding our wares to your collection. They will grow in value as years pass and represent a continuation of this most unique pottery tradition. I’m having the same problem with the weather. I finally had to heat soak my last kiln load for 7 hours in order to get something done. Now it’s too wet to fire up the raku kiln. I don’t have any problem with firing in the rain but it tends to make a big muddy mess in the back yard.Btw, I think I remember seeing a large Edgefield jug recently on Antiques Road Show. The owner had her gaster flabbed by a surprisingly lofty value estimate. Hi Slaghammer! Yes, I think there have been several of them on the Road Show with lofty prices. One piece sold at auction recently for almost 200k!Extra time will definetly be called for on the kiln firing and that may not do it completely. Even though my wood is covered, it soaks a lot of moisture out of the air and slows everything down. I need about 5 days of no rain and good air movement for the wood to be right.